We’ve been running a lot over winter – strange how it pushes other loves in your life into the background without you noticing. We were training for the Istanbul 10k in November and then the Runatolia event at the beginning of March in Antalya. Before we knew it, winter was done with and we hadn’t done any hiking. Cue Easter weekend (albeit in Britain) and some beautiful Spring weather in Fethiye. We made the effort to get out there and enjoy a bit of more remote scenery. First up was the walk from Kayaköy to Cold Water Bay. Of course it wasn’t an official Easter holiday here, but the change in weather and everything – well, we just wanted to have a chillout active weekend where we welcomed spring. We hadn’t been to Kayaköy for 18 months or so. Let’s do something a bit different, we thought. Let’s eat somewhere different. And let’s do a hike that might as well be different. We hadn’t walked from Kayaköy to Cold Water Bay for – we think – 12 or 13 years. 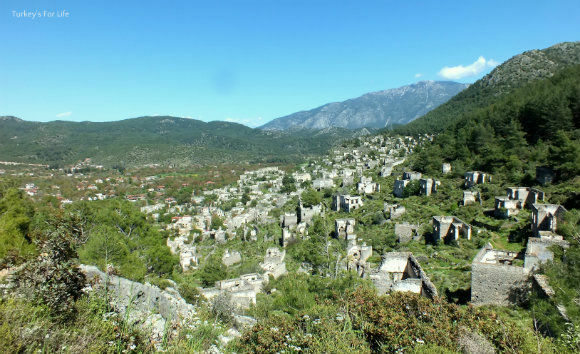 Most of the walks we know around this area are ones we’ve done with Turkish friends who are from Kayaköy village. This is their playground. It’s known to them as Soğuksu (Cold Water). Full name: Soğuksu Koyu. Cold Water Bay. But they actually call it Cold Water Springs. Whether or not there are fresh water springs feeding water into the bay from the mountains – and thus making it cold – we’ve never deciphered. 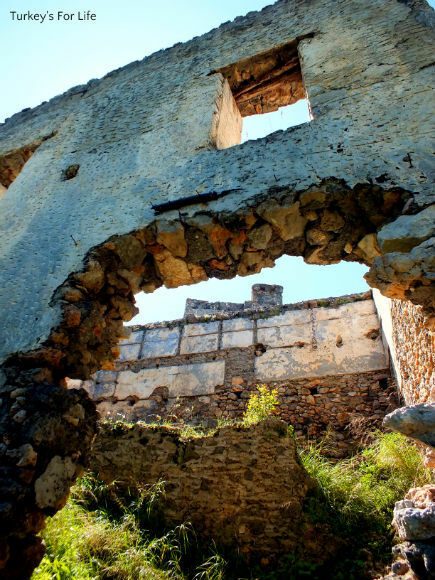 Whenever we’re in Kayaköy, if we do venture into the ruins, we’re usually on the west side near the Higher Church. This time, we were on the east at the second entrance, next to the Lower Church. 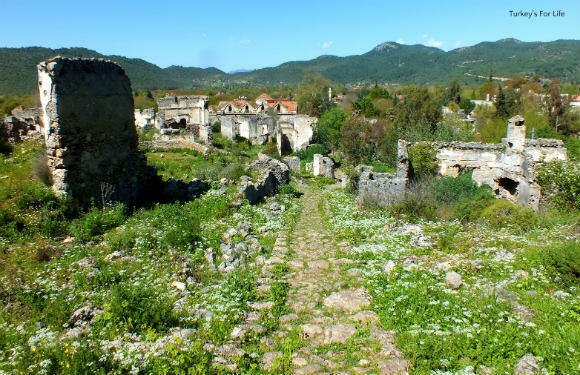 If you take this route, this is where you’ll get collared to pay your 5TL fee for walking through the ruins. If you’re resident and have a Müze Kart, it’s free. Right, off up towards the chapel, then. At the start, it’s an easy path to follow, as you can see, and we’d picked perfect weather. Warm but not stifling and Kaya was doing what Kaya does best at this time of year – lush greenery, meadowland and spring wildflowers framing each crumbling ruin. The last remnants of winter snow clinging on at the top of Babadağ, whose summit was crisp and clear against the cloudless blue sky. These are the days when it’s perfect to be out walking. All feels well with the world and you tell yourself you’re definitely not going to leave it so long next time. As we looked back towards the Lower Church, daisies carpeted the ground either side of the footpath and the first crimson poppies were beginning to reveal themselves. 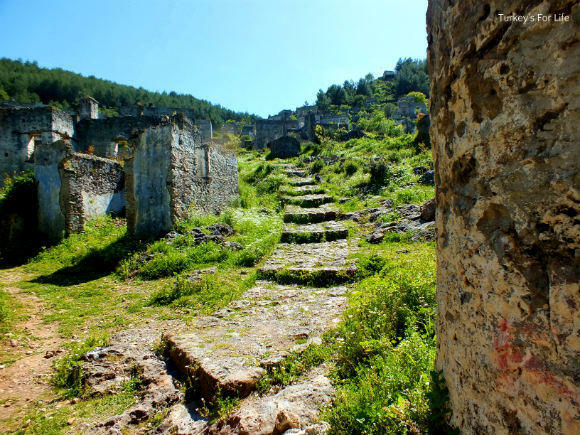 The footpath continues, relatively steeply, and, as you head towards the top of the hill, a panoramic view of the valley and the ruins gradually comes into view. If you need to take a breather, use these moments for your multiple photo opportunities. You don’t actually need to go as high as the chapel to walk to Cold Water Bay. The path passes just below, to the left of it. But we made the short detour to the top for more photos and just to take in the views. Again, this is a great place for a little breather. 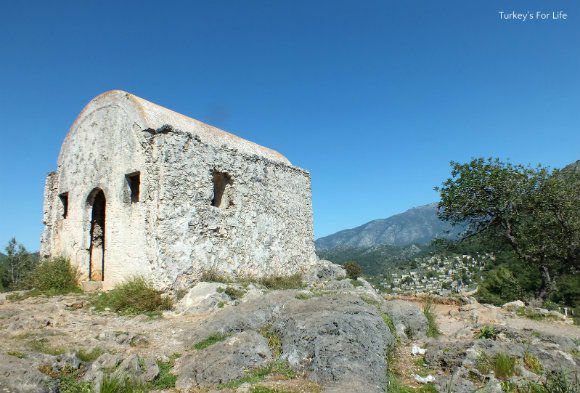 There are many little chapels like this one amongst the ruins of Kayaköy. Some of them go unnoticed, almost camouflaged against the rocky environment. Others are ruined beyond recognition. This chapel is perhaps the most recognisable of them all – it can be seen from so many angles around the village because of its position at the top of the hill. A few photos, a bit of musing on the state of the world (Kayaköy can bring that out in you) and we were on our way again. 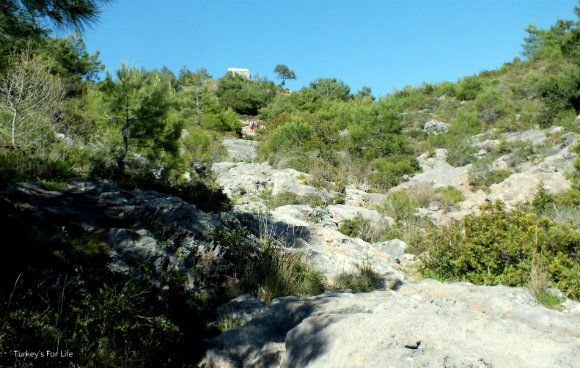 We retraced our steps back to the footpath, picking it up on the crescent of the hill, and started to make our descent. There are different routes you can take down to the bay. Quite close to the top of the hill, as we headed downwards, our footpath forked. We opted for the less obvious path heading towards the left purely because we could see the red blob waymarkers. 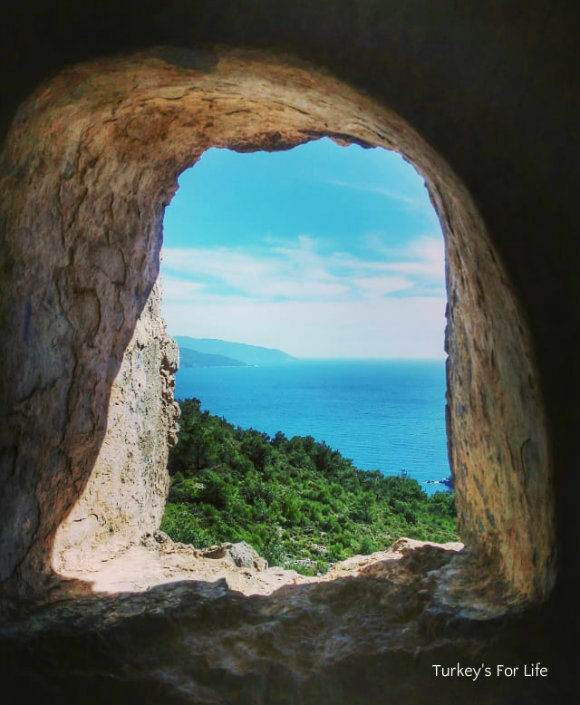 Unless you are very familiar with your route, hiking in Turkey is not a pastime where you can just trundle along without a care for which direction you’re heading in. Official footpaths will have red and white striped waymarkers and you’ll also get the very occasional yellow signpost just to give you peace of mind that you’re still in the right place. The walk over to Cold Water Bay has none of that. A couple of faded arrows and red circular blobs painted on the rocks and trees will guide your way. And your fellow hiker is nothing if not helpful. At a short forested section we walked through, some kind soul has tied bits of rag to the overhanging branches of trees to guide your way. We wished we’d brought a tin of paint with us to go over the faded markers and add more besides. Instead, we topped up any mini cairns we came across with loose rocks. Every little helps and all that. We both agreed, the path was much steeper and much rockier than we remembered and I was glad I had my hiking boots on. This is not a gentle flip flop stroll. At the very least, if you’re wearing sandals, make sure they’re proper hiking sandals with a sturdy sole on them. At times, the path is narrow and full of rubble. At others, solid boulders are your route. But this is what you come hiking for. Decent footwear and an eye for the waymarkers and then you’re rewarded with views like this. If you’ve done the walk from Kayaköy to Ölüdeniz, this inlet is what you can see just before you head down to Ölüdeniz. That footpath is way over on the left, out of shot. We’re heading down and towards the right. Cold Water Bay is hidden from view at this point. 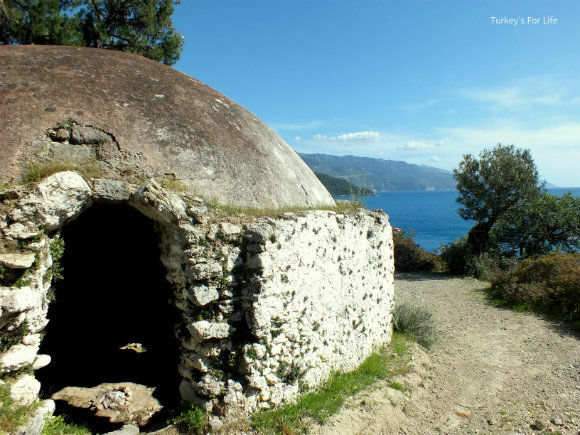 If you follow the path we took, you’ll suddenly find yourself face to face with this Ottoman cistern. We took a peek inside from the doorway (it’s not recommended you step inside as some are deep wells!) but these days, this little dome is a shelter for some. Obvious signs of camp fires in the centre and the telltale discarded beer cans. Anyway, just a few more metres of descent and we come to a neat, pebbled footpath leading us down to the beach. And just when you think you’re in a secluded bay in the middle of nowhere, you’ll see a string of lights heading off to the right. In season, these lead you to a small restaurant – obviously a haunt for those who like to sail. It’s closed out of season, however, so don’t rely on it for refreshments. We sat on the pebbles for a few minutes enjoying the peace and calm. We couldn’t even see if we had company on the yacht anchored in the bay. Just us and the lapping of waves on the pebbles. 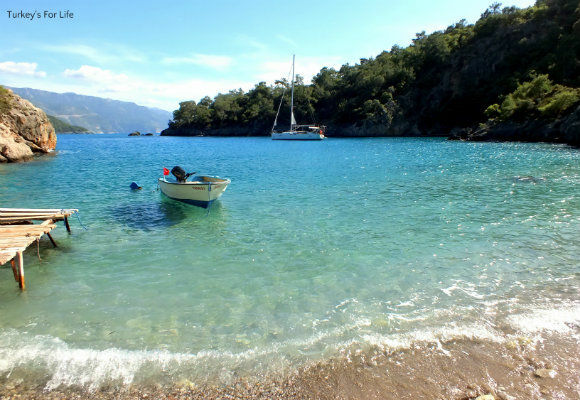 In summer, day trip boats from Ölüdeniz head to these bays. In springtime, though, it’s a scene of serenity. Just what we wanted on that day. Time to take our leave of Cold Water Bay and head back. And you know what that means, don’t you? That steep rocky descent we just made is now our steep, rocky ascent. We definitely built up a thirst as we clambered along the footpath and the sight of the top chapel at the top of the hill, in the distance, was very welcome. This is a very short hike but it’s definitely good leg and lung exercise! Reaching the top of the hill meant we could then walk back down through the ruins and get refreshments at the bottom. And that’s exactly what we did! Although the hike to Cold Water Bay is a short one, it is tough under foot. Make sure you wear sturdy walking boots or shoes. Including the detour to the chapel, it took us 1 hour to walk to Cold Water Bay. The hike back up the hill and then down through the ruins took 45 minutes. The distance from the Bottom Church to Cold Water Bay is 1.7km so the total hike distance is 3.4km. Like we said, very short but it’s a good leg exercise. 220 metres of ascent on the way back. There are no refreshments en route so take at least 1 litre of water with you, per person. Maybe more in summer months. There are lots of places to eat in Kayaköy, pre or post walk. This time, we had lunch at Izela Restaurant but you can also get snacks like gözleme at Bülent’in Yeri and other eateries. For barbecue fans, Cin Bal is a great place, too. Of course, you could always take a picnic with you and eat it at Cold Water Bay or even up at the chapel. 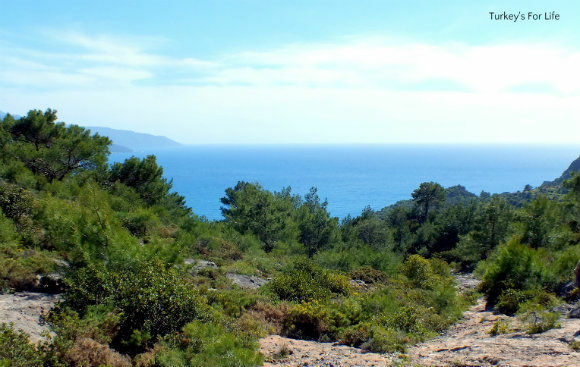 If you enjoy hiking or even just gentle strolls along the flat, we have more routes on our page of Fethiye walks. 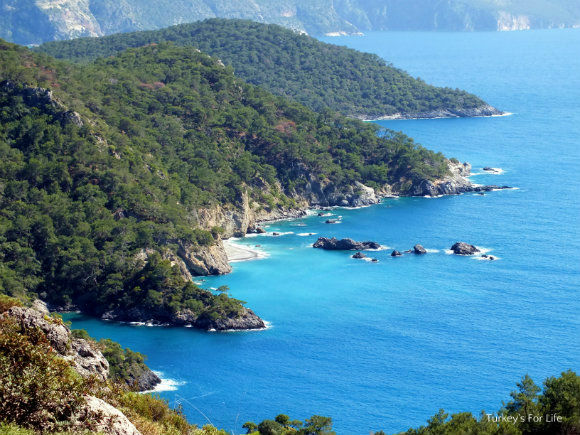 If hiking isn’t your thing, here are lots more ideas for what to do in Fethiye. One to be put aside for when the ankle is completely better. Hope your ankle is getting better now, @Backtobodrum. 🙂 Cold Water Bay is a great short walk. You could maybe take Jake, too.